to prevent their insides from get� ting wet. 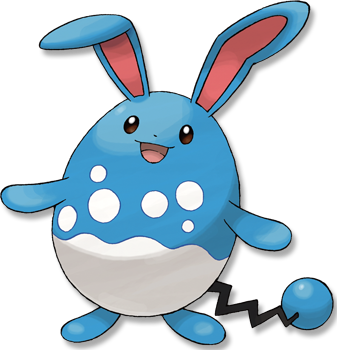 Ruby/Sapphire AZUMARILL can make balloons out of air. It makes these air balloons if it spots a drowning POK�MON. The air balloons enable the POK�MON in trouble to breathe. Emerald It lives in water virtually all day long. Its body color and pattern act as camouflage that makes it tough for enemies to spot in water. Leaf Green By keeping still and listening intently, it can even tell what is in wild, fast-moving rivers. Diamond/Pearl Its long ears are superb sensors. It can distinguish the movements of living things on riverbeds. Platinum It can spend all day in water, since it can inhale and store a large volume of air. Heart Gold By keeping still and listening intently, it can tell what is in even wild, fast-moving rivers. Soul Silver When it plays in water, it rolls up its elongated ears to prevent their insides from getting wet. Black It can spend all day in water, since it can inhale and store a large volume of air. White It can spend all day in water, since it can inhale and store a large volume of air.